Slicing. Curing. Marinating. Indulging. Roasting. Kneading. Preserving. Savouring. These 8 words, all intrinsic to The Rocks Friday Foodie Market, are music to my eyes (or should I say music to my tastebuds). 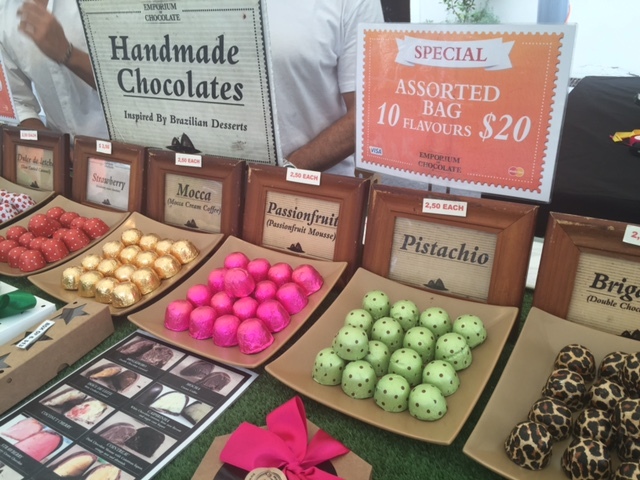 So, when I was invited to visit one of Sydney’s most unique markets for a stall by stall tour I couldn’t resist. 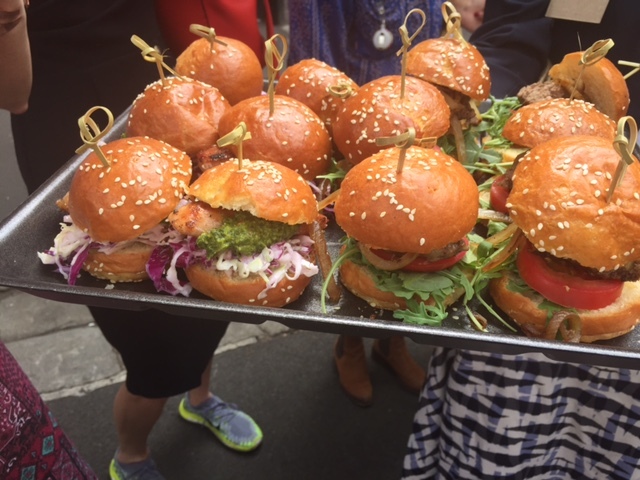 Every Friday along the cobbled laneways of The Rocks stalls serve mouth-watering mini feasts to tourists and CBD workers. I’m talking gourmet burgers, traditional Turkish gozleme, handmade gelato, fresh sushi and more. 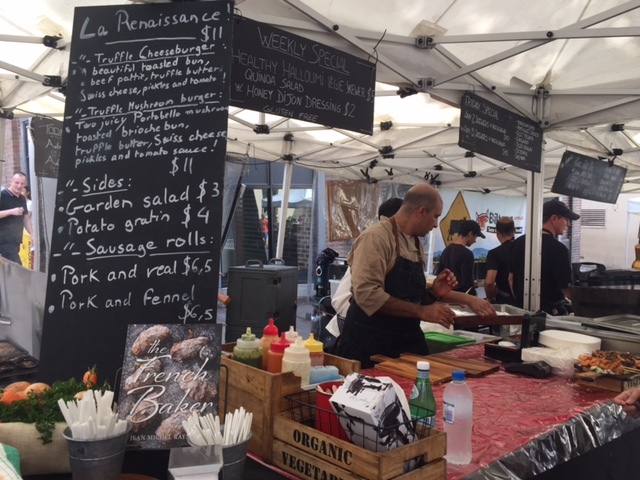 The passionate chefs and artisans bring together traditional cuisine from France, Germany, South Africa, Japan and Italy (to name a few) into some of the most history rich streets in Australia. Its moments away from Sydney’s iconic Harbour Bridge. And, when a cruise liner isn’t in town, you can even take in the views towards the Opera House. Enough background, here I wanted to share my foodie highlights, alongside some of the stories that make each stall special and unique. 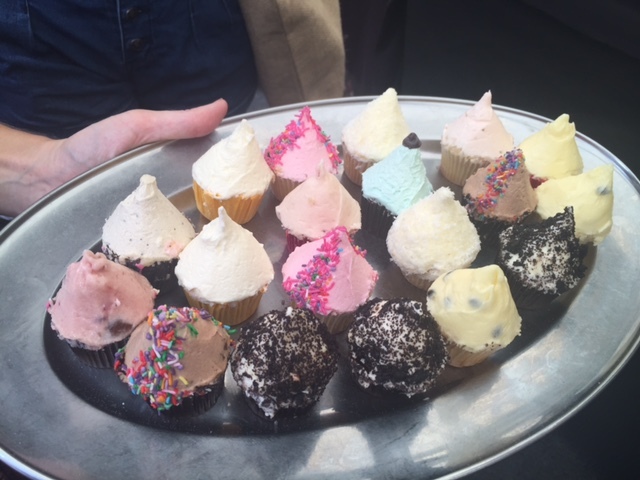 Of course I didn’t manage to devour everything you see here – luckily I had my husband to help me with the sampling so we could divide and conquer……. Mini sausage rolls from La Renaissance, the first patisserie in the Southern Hemisphere to be part of Relais Desserts, the world’s most exclusive Fresh Patisserie association. 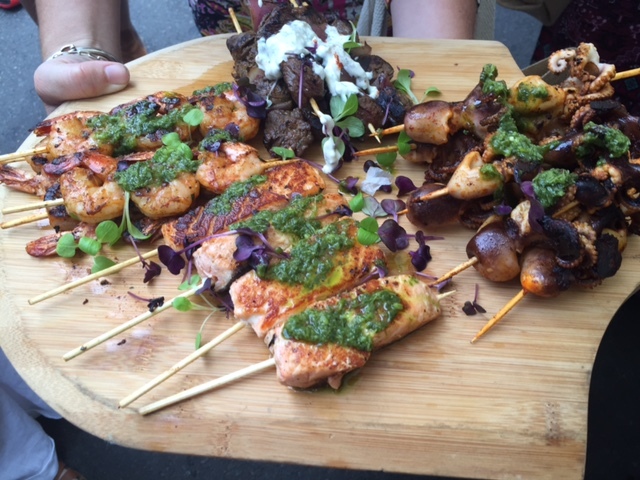 BBQ skewers from Danieli, a family owned business serving up delicious vegetarian, meat and fish skewers with homemade sauces and relishes. 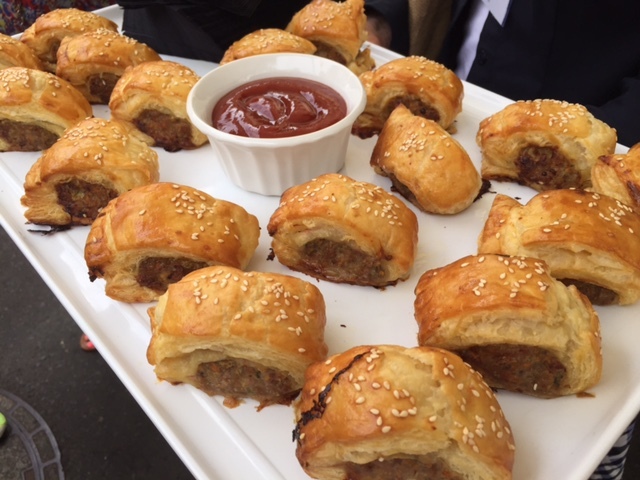 Mini pork rolls from Phillip’s Foote, one of the oldest restaurants in The Rocks, it was named after Captain Arthur Phillip who led the first fleet from England to Australia in 1788. Mini wagyu beef burgers from The Fine Food Store, perhaps the most tempting cafe come wine bar you’ll find hidden down the cobbled lane ways of The Rocks. Cupcakes from Mini Monet Cupcakes, these mini delights are inspired by the work of Claude Monet – each cupcake resembles one of Monet’s well known impressionist ‘Haystacks’ paintings. 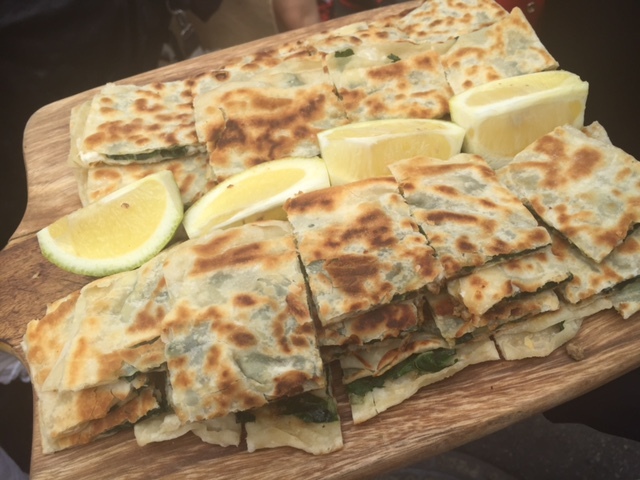 Spinach and cheese gozleme from D&re, a small business who, judging by the unbelievably long queue at their stall, are worthy of their reputation for Sydney’s best Turkish gozleme. 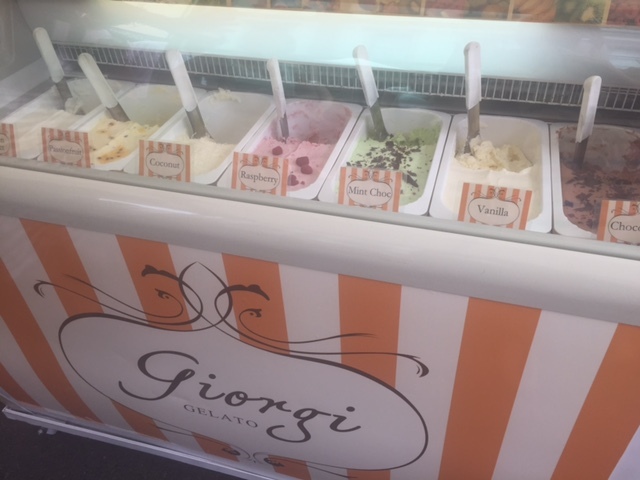 Gelato from Giorgi’s Gelato, a husband and wife team who prepare the highest quality award winning Italian gelato with recipes handed down from their Italian family. Traditionally crafted chocolates from the Emporium of Chocolate, inspired by Brazilian desserts, each piece is handmade and packaged in distinctive wrapping (check out the animal print). 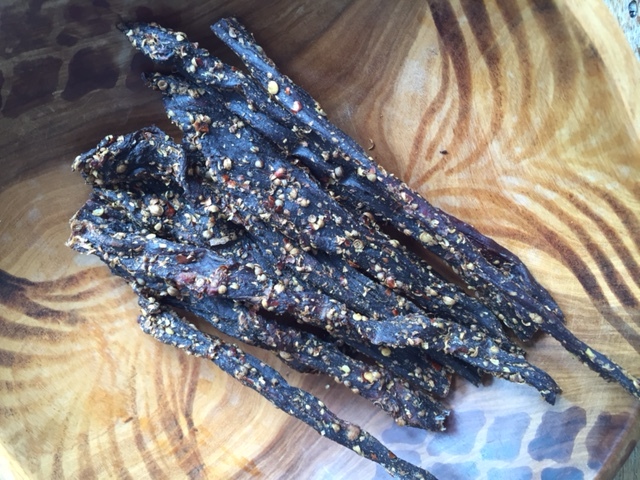 Air dried beef from Biltong-To-Go, is made in Australia to a traditional South African recipe, using grass-fed beef and no added preservatives. Hungry? Of course you are. 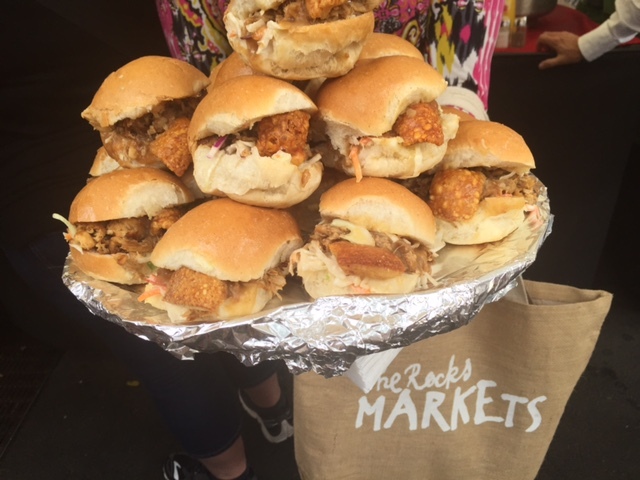 Next time you’re looking for some Friday foodie fun in an open-air setting jump on a Sydney ferry and make your way to The Rocks Friday Food Market. You’ll find the market at Jack Mundey Place and Playfair Street (corner Argyle and George Streets) between 9am and 3pm every Friday. 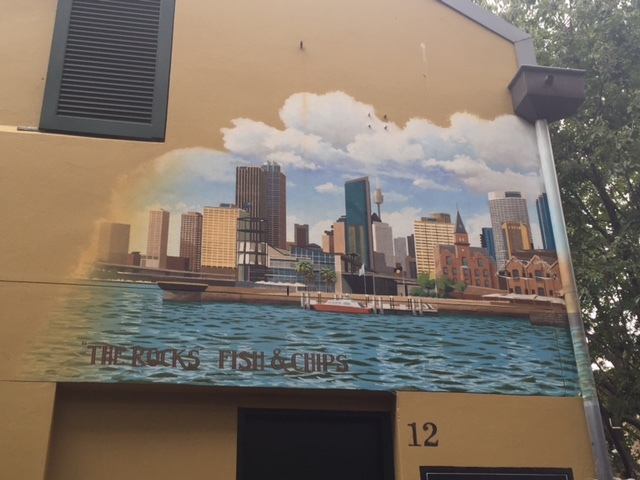 Tags: food, market, Sydney, The Rocks. Bookmark the permalink. Thanks Laura – of course the location being so close to the Harbour makes this market extra special. Yes the skewers were delicious – I sampled the fish ones. Keep me posted on your trip to Sydney! Not long to dinner time I hope….?! I love your blog! As a market enthusiast, I love seeing what’s available in other places of the world… It helps me plan my travel wish list! Thanks Laura! 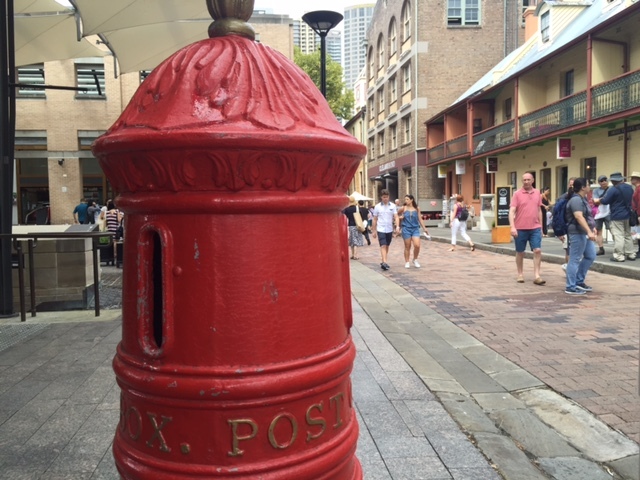 I’m a market enthusiast too….and yes you should put Sydney on your travel wish list!